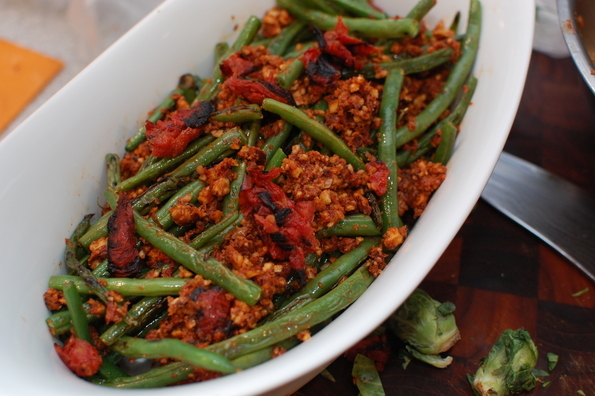 Blistered Green Beans with Roasted Tomato Almond Pesto - You're Making a Mess!You're Making a Mess! This may just be my new favorite vegetable recipe. Well, let’s say green vegetable because it’s pretty hard to beat a perfect bruschetta in the middle of tomato season. But this is a close second. The secret is in the caramelization of, well, everything. The green beans have to be blistered, and the tomatoes charred. The almonds toasted to a deep brown. Put it all together and you have a collection of flavors that simultaneously complement and contrast each other. First, the tomatoes. I’m going to admit it — I cheated. Well, I wouldn’t exactly call it cheating — I made this in November, and it’s a fairly well known fact (well, at least I know it!) that good canned tomatoes are much better than the off season fresh ones you get in the supermarket. So I did a little experiment: I used whole San Marzano tomatoes, out of a can, instead of fresh cherry tomatoes. I know! Heresy. But you know what? They turned out great and I would do it again in a second. The secret is to keep the tomatoes relatively whole, except make a small hole with your finger and squeeze out the liquid in the middle. Give them a quick pat to dry, and then toss them with a light coating of olive oil and arrange them on a sheet pan so they’re not touching. Roast them around 350 until the edges start to get black. When they’re done, scrape them up with a spatula and proceed as normal. By the way — roasting canned tomatoes like this works to add a huge flavor shot to all sorts of stuff like dips, sauces, hummus, etc. Next, the green beans. I got out my cast iron skillet, cranked the heat up and got some vegetable oil just at the point of smoking. Toss in some washed (but very dry!) green beans and let them sit until they’re thoroughly blistered. Then give then a turn. Here’s where it all gets good — combine half of the tomatoes with the almonds (and the rest of the ingredients — see the recipe!) and give it a whirr in the food processor. The pesto that results is good enough to eat with a spoon, and even better on top of the blistered green beans. Toss it all together and consume voraciously!